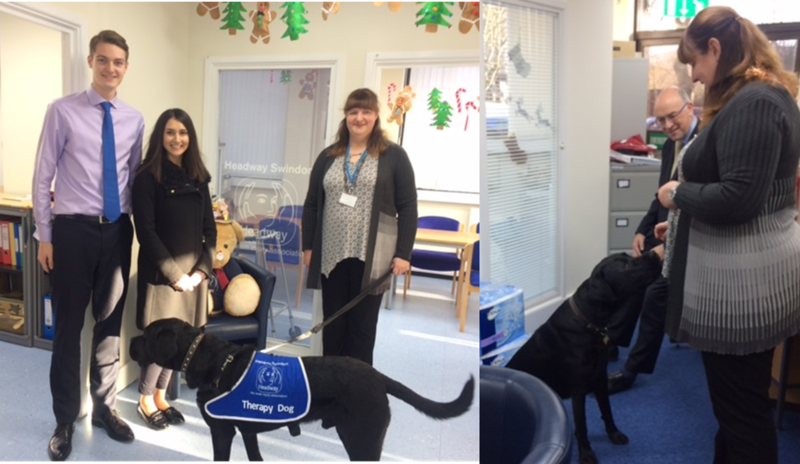 As Morris Owen’s chosen charity for the new year is Headway Swindon & District, we thought it would be beneficial to visit their offices and learn more about this organisation who have been supporting adults with traumatic and acquired brain injury, along with their families and carers since 1989. Bounding to the door the first member of the team to greet us was Chase, a 2 year old Labrador/Bull Mastiff Cross who plays a very important role as a therapy dog helping clients who feel isolated and lonely after a brain injury by giving lots of love and receiving cuddles. He can also do a few neat tricks which will help with communication skills and dexterity. Chief Executive Jane Weston kindly showed us around the building explaining that they employ 16 staff, of whom only 5 are full time and also rely heavily on volunteers to meet the needs of the 128 visits per week from their clients. Learning what’s important to them enables Headway to provide a tailored Cognitive Rehabilitation Therapy Programme to help them achieve their goals. This worthwhile charity could not operate without the support of donations, fundraising and volunteers. Here’s a link to their website if you would like to read more about what they do http://www.headwayswindon.org.uk/.